The Teesside Airshow may not be running this year, but the Red Arrows surely have made an impression in previous shows! They’re famous for their bright red RAF Hawk jets, rainbow contrails and daring displays. You may have caught them at other national shows like the Bournemouth Air Show and the Sunderland International Airshow. What you may not know, is that these are still active servicemen and women flying these planes. The RAF refers to the “reds” as the “public face of the service… representing the speed, agility and precision of the RAF”. The Red Arrows are made of 10 pilots and a commanding officer – imagine perfoming loops while keeping an eye on your 10 other colleagues! It’s not for the faint-hearted! Here’s three of some of the most famous footballers from the 70s enjoying a cuppa in the airport canteen. Far left is Alan Foggon. Born in West Pelton, County Durham, Foggon enjoyed a long career, playing for Sunderland, Cardiff, Middlesbrough and Newcastle clubs. John Hope was the goalkeeper for Newcastle United, alongside Foggon, in the late 60s, early 70s. Finally John Craggs on the right, both in Flint Hill, County Durham, played for Newcastle, Middlesbrough and Darlington Clubs between 1966 to 1985. It’s likely this photo was taken when Newcastle were travelling to Budapest for the Fairs Cup. Although the Fairs Cup no longer exists, it was Newcastle’s first European Competition and they won 6-2 against Újpest FC. Here’s a photo of former French President, Jaques Chirac, meeting Tony Blair in 2000. At the time, Blair was Prime Minister and served the constituency of Sedgefield in County Durham, just down the road. 2000 wasn’t the only year Blair visited Durham Tees Valley. In 1997, the year of Blair’s landslide victory for the labour party, Blair visited Durham Tees Valley Airport to unveil a new terminal building. Huge thanks to @independant_teesside for this one! Muhammad Ali is best known as a world famous boxer and political activist. His debut to the professional boxing ring was in 1960 and went on to become 3 time World Heavyweight Champion. Here he is, arriving in Durham Tees Valley Airport in 1977 with the family. The visit was to help promote and raise money the South Shields Boxing Club in Newcastle. Thousands turned out for a very special guest and toured County Durham to meet local fighter Reg Long, retired English amateur Bruce Wells as well as his avid fans. These photos show the greatest of all time Muhammad Ali arriving at Teesside Airport on 14th July 1977. . This came about after Johnny Walker, a Whitburn painter and decorator invited Muhammad Ali, then heavyweight boxing champion of the world, to travel from the United States to South Shields and help raise money for his boxing club which he did via Teesside (Unable to confirm whether he had time to sample a parmo) ?? #itsasmallworld . . Photo source – @teessidegazette ? In 1966, Teesside went from being a military and pilot training centre to a hub of international passengers. The new passenger terminal was built in the early 60s and Teesside International was born. It wasn’t until 2004, that the airport renamed itself “Durham Teesside Airport” as we know today. Princess Margareth of Sweeden, who was living near Oxford with her family at the time, visited Teesside Airport to help promote and announce their new terminal building. 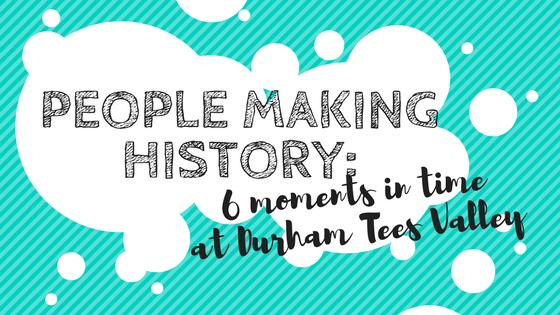 Here’s something you probably didn’t know about Durham Tees Valley Airport history! “Teesside Airport” has a huge military past and perhaps the most famous wartime figure is Andrew Mynarski. Although born in Canada, he worked with the No. 419 Squadron RCAF based at Middleton St George, better known today as Teesside Airport. When operating a Lancaster Bomber in 1944, his crew were attacked by a JU-88 Nightfighter. He turned away from an open escape hatch to save a fellow pilot but later died from burn injuries. Based on the surviving pilot’s testimony, Mynarski was awarded a posthumous Victorian Cross and his legacy lives on at Teesside Airport. Here’s the statue, dedicated to him in Winnipeg.